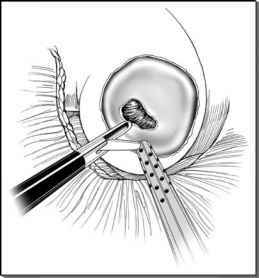 The primary trocar insertion has been described earlier. Secondary trocars must be inserted under direct laparoscopic visualization to avoid inadvertent visceral injury. The proposed site of trocar placement on the abdominal wall is pressed with a finger, and the indentation made is viewed internally via the laparoscope. We prefer to localize the site of trocar placement by puncturing the abdominal wall with a hypodermic needle attached to a syringe. The skin incision is made commensurate with the size of trocar to be inserted. The trocar is firmly grasped against the palm of the hand and inserted perpendicular to the abdominal wall. Tangential skewing of the trocar through the abdominal wall results in limited mobility of the port and instrument, additionally, as the procedure progresses the trocar hole tends to progressively enlarge, leading to gas leakage around the trocar. We prefer to fix all trocars to the skin using a 0-Vicryl suture.